If your custom crush or contract clients want to view their wines and run reports, a restricted login can be set up for them that will show only their wines and is read-only (view but no actions may be entered). This type of access is called an Owner Login; it does involve a change to your subscription and can only be added by the Local vintrace Admin or vintrace Support. For information on managing your subscriptions/license, click here. Setting up an Owner Login (which is considered an “individual” account) requires that their organizational owner account be set up first. For information on adding a new owner (client) and set their auto code, click here. Go to the Address book; click the Add button in the lower left and choose Owner login. We suggest putting either the full name of the client or the winery name itself in the First Name field. In the Last name field, we suggest OWNER LOGIN. 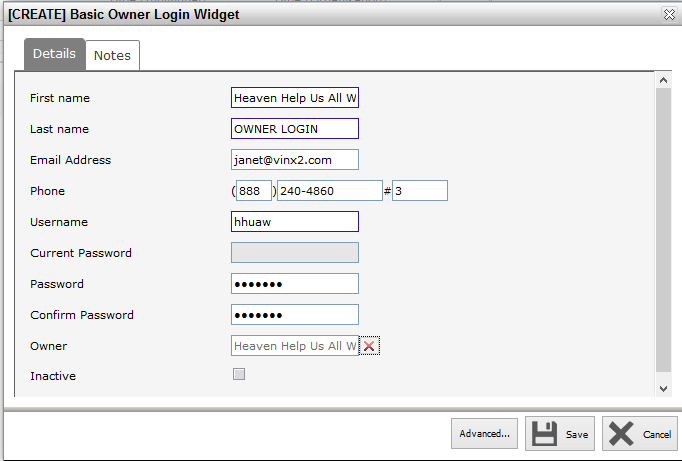 Assign the username and password and assign the owner in the Owner field. We recommend that you assign a temporary password (your client 3-letter code + the current year - all in lowercase) and force the user to change the password when they login. When complete, click Save and send the details to your customer. You will be asked to change the password on your first login. We suggest a moderately strong password (6-8 characters with at least 1 upper case letter and one numeral). Please note you will need to use Google Chrome, Firefox or Safari as vintrace is not compatible with Internet Explorer or its successor, Edge. Please set your browser to allow pop-ups. Please let us know if you or your client have any questions or encounter any issues during login; we can contact vintrace on your behalf.